century tomb in Agra. 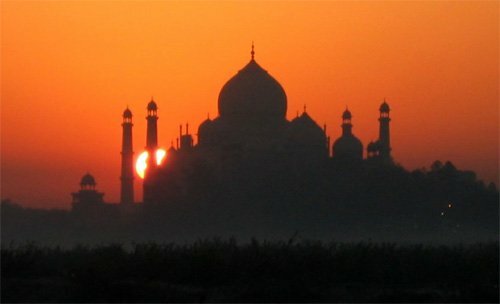 Yes, India has its temples, its palaces and its forts- but, to the foreign visitor and to many Indians too- the Taj is India. Complimentary enough. And true. But call it what you will- poetry in stone, a monument to love, whatever- it all sounds rather clichéd. 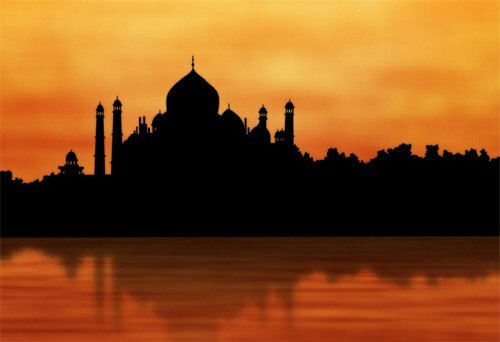 The point is, nothing that’s said about the Taj can actually bring it alive to someone who hasn’t seen it. Until you stand at the entrance to the tomb, dwarfed by the red sandstone of the vast gate, and look past the carefully manicured lawns towards the Taj, you can’t really get an idea of its beauty. 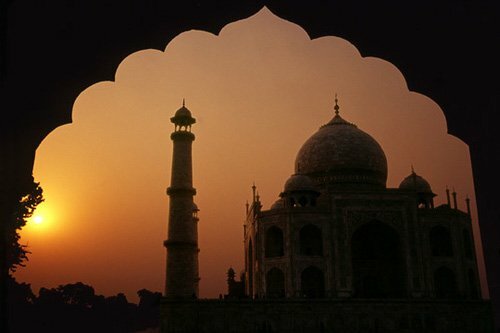 No photographs, no etchings, no `postcards from Agra’ can give you anything except a tiny glimpse of what you can expect. Everybody- or almost everybody- knows the nitty-gritty about the Taj. Built by the Mughal emperor Shahjahan in the early 17th century as a mausoleum for his beloved empress Arjumand Banu (`Mumtaz Mahal’ for most people), the Taj is easily one of the best known tombs in the world. School children across the length and breadth of India are taught that the Taj took more than a decade to build; that its architect and its artisans, even the semi-precious stones used in its exquisite pietra dura- came from far and wide. 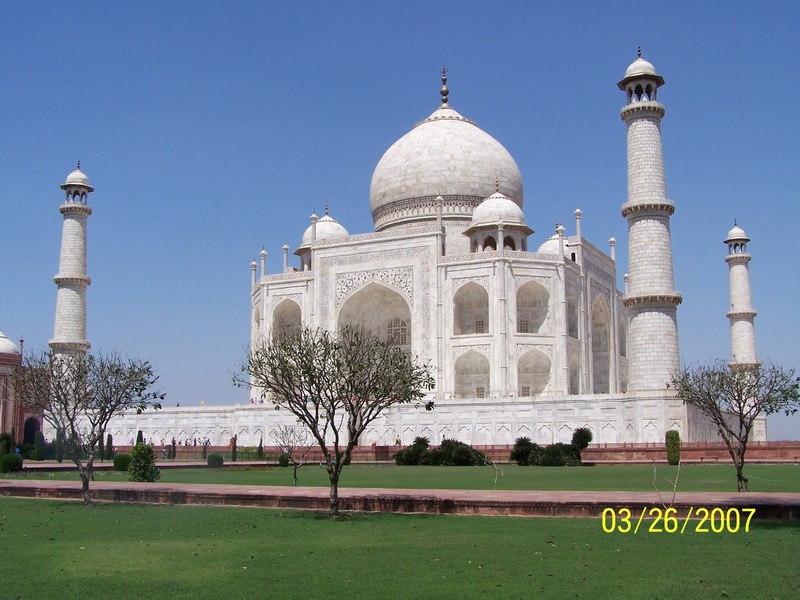 Spellbound tourists are told by local guides that Shahjahan had planned an identical tomb for himself, to be built in black marble- but died before he could fulfil his dream. That Shahjahan, to prevent the chief architect from ever creating anything as ethereal, had his hands chopped off. Perhaps an overenthusiastic medieval historian’s imagination. But- no matter what, the Taj is worth seeing, just for itself. Forget about the story of an emperor so much in love with his wife that he wanted to make her a tomb the world would admire. Forget about all the legends and the tales you’ve ever heard about the Taj. Forget that you’re in one of the most crowded, most polluted parts of the world. Just gaze on- at one of the most magnificent buildings on earth. The approach to it is almost disappointingly commonplace- but then, it helps highlight the beauty of the building itself. 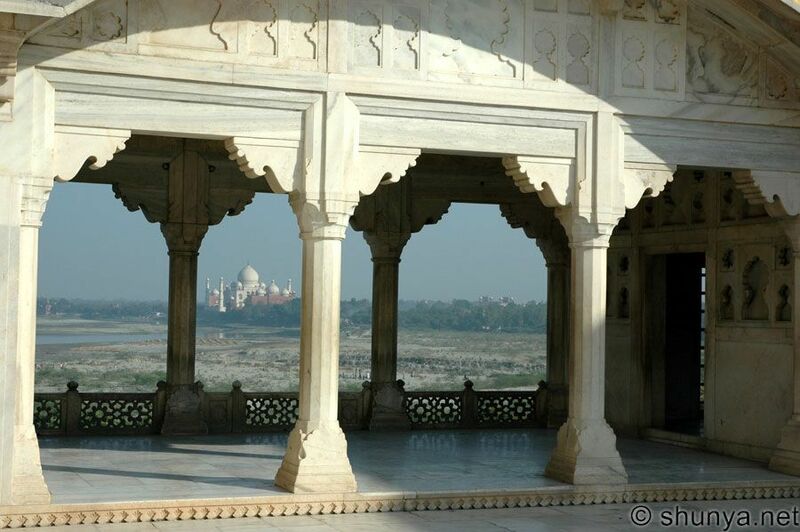 Agra is a typically north Indian plains town- dusty, drab and uninspiring. It has its medieval monuments, of course- the Agra Fort and the tomb of Akbar, Sikandra- but the atmosphere is one of a busy, rather dirty city. A dull but modern city. Nothing in town prepares you for the Taj. 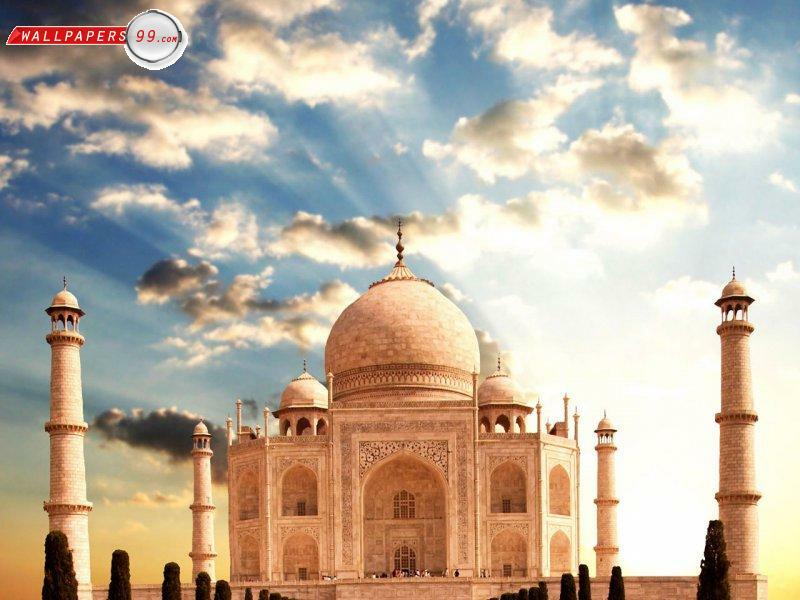 No broad and beautiful avenues, no signboards pointing the way to India’s best-known monument. A dirty road leads to a huge, crowded parking lot about a kilometre from the Taj, where you disembark and board one of the special environment-friendly minibuses which do the remaining trip. The more adventurous can take a ride in a camel-drawn cart: smelly, uncomfortable but undeniably unusual. The ride terminates at a large gate of red sandstone, where you buy a ticket and head through the gate. Down a wide flagstone path, past a sandstone colonnade- and through another high gate of red stone. The moment before you go through the gate, it’s just another- although pleasing- Mughal gate. The moment you’re through it, you can’t help but stand and marvel at the beauty of the building before you. Despite the crowds of tourists milling all around. Despite the hundreds of times you may have seen it before, in photographs, on film, in real life. The Taj stands, not dazzling white- but definitely cleaner than its polluted yellowness of a few years ago- beside the Yamuna. A traditional Persian charbagh garden, divided into quarters by streams of running water, extends, cool and green, at the foot of the tomb. Neat paths lead to the central platform from towering gates, carefully decorated with inlays of white marble. Pine trees and flowering shrubs form a foreground to the edifice, which stands, topped by an onion dome and surrounded at four corners by tapering minarets- perfectly symmetrical and flawless. The symmetry is carried over into the surroundings; to the left of the tomb is the mandatory mosque- and, so that the entire setting retains its symmetry, an identical building to the right too. The second is a musafir khana, a guesthouse where visitors to the Taj could rest for a while- as they still do. Inside the mausoleum, steel railings block off the walls, the central tombs and everything else that couldn’t withstand much more caressing by enthusiastic tourists who want to be able to say they’ve touched the Taj. Delicately worked marble lattices screen the two cenotaphs- of Mumtaz Mahal and of Shahjahan- and everywhere, across the walls, on the dadoes- is pietra dura- fine inlays of semi-precious stones, in dozens of subtle colours, woven into lovely arabesques and elegant calligraphy. 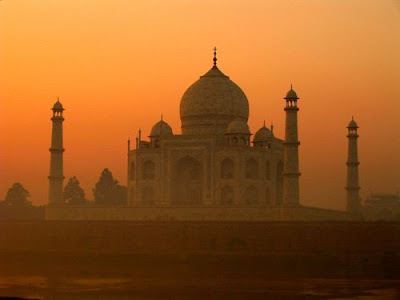 Tourism brochures will tell you that the Taj looks loveliest on a full moon night, when it glistens like a pearl- or just after a winter dawn, when mists rising from the Yamuna shroud it, offering a tantalising glimpse of the building. But when you see it doesn’t really matter. 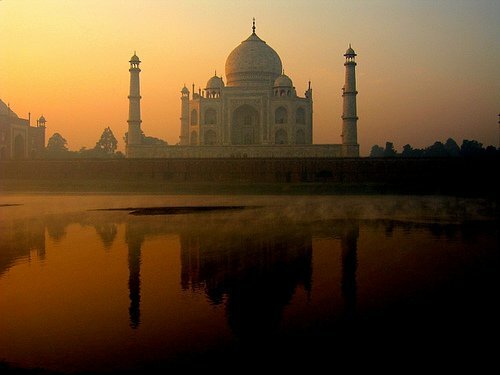 The Taj is beautiful. Any time. In any age.